You’ve seen it hundreds of times. You go over to your favorite bar, order a cocktail, and watch, mesmerized. In what seems like a couple of minutes, your bartender mixes, shakes and pours out your cocktail with the air of a magician. Voila! As much as it seems like cocktail-making is a bit of this and that thrown together, shaken and poured, it is actually about precision and perfection. In some sense, mixology is less like home cooking and more like baking, where the measurements of your ingredients, the order in which they’re added, and the process – all must be perfect and accurate! Ask any good bartender how they manage to produce the same, boozy-but-delicious concoction, over and over again, and they’ll let you in on a little secret. Literally, this is the smallest of bar tools, and yet the most essential one – the bar jigger. What Is a Bar Jigger? How Does a Bar Jigger Work? 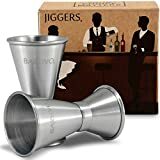 How to Choose a Bar Jigger? 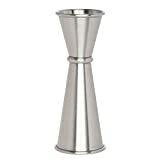 A bar jigger is a tool used by bartenders to measure and pour an exact amount of alcohol into the cocktail shaker or mixing glass. Different cocktail recipes call for varying measures of alcohol, some recipes even call for different kinds of alcohol. Instead of taking a chance and pouring out alcohol by estimating the quantity, you’re much better off using a bar jigger, and you’ll see why. 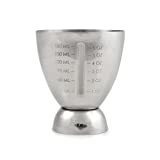 A bar jigger, like mentioned above, gives you a precisely measured amount of alcohol in your cocktail. This helps to maintain a consistent taste, because if you end up adding more or less than what the recipe calls for, your cocktail is going to taste strong or too watered-down. Plus, most cocktails are either shaken or stirred with ice, both of which dilutes the drink, and not having the right quantity of alcohol in your drink is going to leave you with a funny-tasting drink. You’ll know this if you’ve ever tasted a cocktail that made your head spin with the first sip because of how boozy and strong it tasted. Bar jiggers are available in an assortment of sizes and styles and it’s important to understand these before you choose a jigger for your bar. 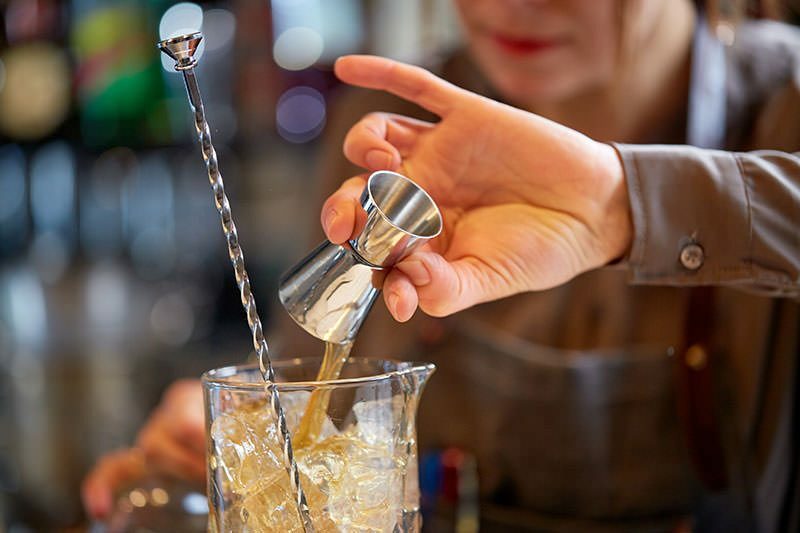 Most bartenders use their jigger with speed and precision, by holding it between the thumb and forefinger, or between your first and second fingers and pouring the alcohol swiftly. Based on their capacity, there are are two basic types of bar jiggers that are most commonly used by bartenders. Single jiggers contain only one side and can be used for simple recipes. Usually, single jiggers will have one capacity, but some may come with graduated markings for smaller measures. Double jiggers are built in an hourglass shape and have two bowls, usually one bigger than the other. 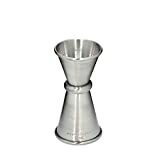 This is the most common type of jigger used in most bars and it gives you the flexibility to pour out anywhere between 2 ounces to as little as 0.25 ounces of alcohol into your recipe.Whether single or double, bar jiggers are also found in different styles. The purpose of these styles is basically to add to the look of the jigger – a sleek, elegant one usually looks great when teamed up with a shiny cocktail set. Classic jiggers are hourglass shaped double jiggers that are usually made of stainless steel and are wide in shape. Japanese-style jiggers are inspired by the precision of Japanese design and have a sleek, narrower shape and are more elegant to look at than classic jiggers. Measurement Markings: Look for a jigger that is graduated, or has markings on the inside. Finding one jigger with multiple markings makes it easier than juggling between 2 or 3 different jiggers. Durability: You’re going to be using your bar jigger a lot, if you plan to mix cocktails regularly. You’ll need one that can withstand constant exposure to alcohol and water, and doesn’t corrode at all. Stainless steel jiggers usually last longer than those made with other materials. 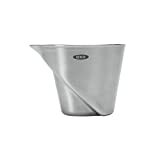 Spill-proof: A bar jigger shouldn’t be so wide that it allows the spirits to spill while pouring. In this aspect, narrower, taller jiggers fare much better than classic hourglass-shaped jiggers. Next, it’s time to put your jigger-choosing skills to some good use, by taking a look at some high-quality bar jiggers handpicked for you. Oxo is a brand best known for innovative culinary products. With this stainless steel-two sided jigger, they bring you a bar tool that has great utility and gives you a precisely-measured pour no matter what. It has etched markings on both sides for precision, and these markings are laser-etched so they won’t wear off, no matter how frequently you use this jigger. Capacity: 1.5 ounces (bigger side) with 0.75-ounce and 0.3-ounce markings. 1 ounce (smaller side), with 0.25-ounce and 0.5-ounce markings. High-grade stainless steel makes it durable. No corrosion/rusting despite frequent use. Special non-slip grip between sides ensures no slipping. Slightly expensive compared to some models. 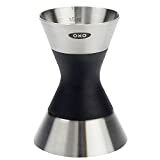 You can buy the OXO double jigger Amazon. This is definitely a great product to buy, whether you’re a seasoned bartender or a cocktail enthusiast just starting out. With its sleek, no-slip grip and perfectly accurate measurements, you’re never going to mess up how much you pour into your cocktail, ever. This is a Japanese-style double jigger from HIC. Made of high-quality stainless steel and with a sleek, brushed finish, this is a useful and elegant addition to your bar. 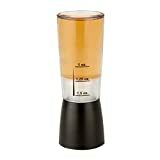 It is easy to hold and the markings on the inside give you precise measurements no matter which cocktail you’re making. Capacity: Smaller side holds 1 ounce (30 ml) with 0.5-ounce (15 ml) and 0.75-ounce (22 ml.) markings. Larger side holds up to 2 ounces (60 ml) with 1.5-ounce (45 ml) marking. Multiple markings for versatile measurements. Does not have 0.25-ounce marking. The Japanese-style jigger from HIC is available for purchase at Amazon. For the money, this Japanese-style bar jigger is an absolute steal! Unless you’re particularly finicky about pouring that 0.25-ounce measure of alcohol (you could always use a bit of judgment and use half of the 0.5-ounce mark), this is a great addition to any bar, be it a colossal restaurant bar or a tiny cabinet in your home. If there were a beauty pageant for bar jiggers, this is the one that would walk away with the crown. Indeed, this stunning double-sided jigger from Advanced Mixology has a beautiful, hand-hammered copper finish. While it isn’t made of stainless steel, it does come with a food grade lacquer coating which protects the coppery glow and also keeps your cocktail safe by preventing any reaction between the copper and alcohol. Capacity: Bigger side holds 2 ounces, smaller size holds 1 ounce. Accurately pours out 1 or 2 ounces. No markings for smaller units between 1 and 2 ounces. Not as low-maintenance as stainless steel. 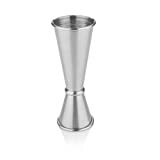 Amazon where you can get your hands on this gorgeous bar jigger from Advanced Mixology. This is undoubtedly a beautiful bar accessory to own, but at the cost, it is quite expensive too. Buy it if you like something classy and elegant, but be prepared to do some math if your cocktail recipe calls for a 1.5 or 0.5-ounce measure of something. Whether you’re a professional bartender or a beginner, there’s nothing more important than getting your measurements right. You may have mastered all the techniques of cocktail-making, but if your basic pour isn’t right, you are going to be left wondering why your cocktail doesn’t taste quite right. On the other hand, with perfect measurements, you’ll end up with a perfectly-poured, delectable cocktail, whether you’re making it for the first time, or the hundredth.